Joe Candidi of the Golden Sunrise brigade on South Board Street during the 2018 Mummers Parade, January 1, 2018. Update: Eagles' Jason Kelce will march in the Mummers Mardi Gras parade in Manayunk on Sunday, Feb. 25. Philly.com reports the Superbowl champion is now a member of the Avalon String Band. 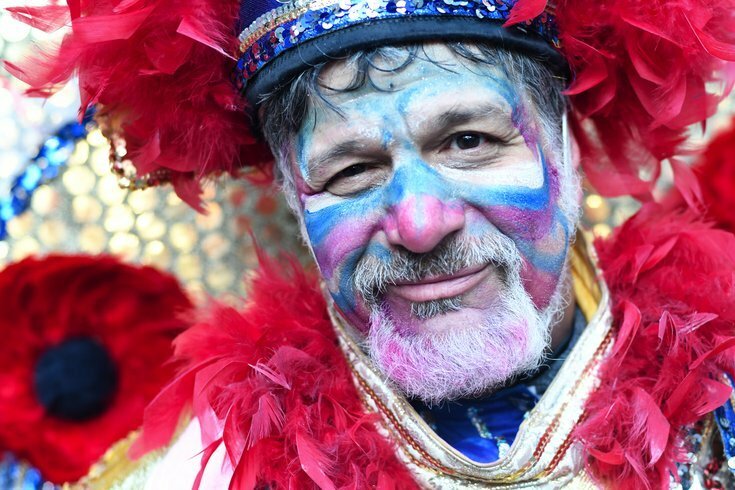 Each February, Mummers head to Manayunk to form a family-friendly Mardi Gras parade. Crowds lined along Main Street will be treated to free performances from 16 string bands, beginning at 1 p.m. on Sunday, Feb. 25. Below are the participating string bands, in their marching order, as well as which restaurant will serve as their makeshift clubhouse after the parade. If it rains, the event will take place Sunday, March 4.